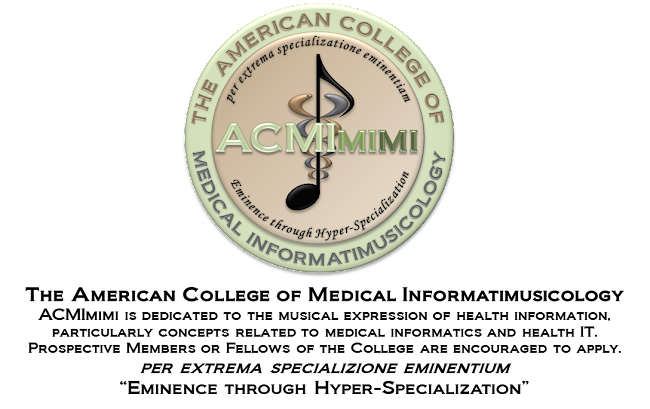 The following individuals are Members of or Fellows in the American College of Medical Informatimusicology and, as such, are afforded all rights and privileges of those held in such esteem. Members are listed by date of admission to the college from most recent to earliest. Fellow contributions and achievements in the field are duly noted. Fellows are indicated in large, boldface type and include the FACMImimi designation. Had cameo role e-Patient Dave in "Gimme My DaM Data"
Concocting evil plan for a joint performance of ZDoggMD and Dr. HITECH. Avid admirer of the genre, especially around such classics as "Gimee my DaM Data"
Wrote a novel, Pepperland, peppered with music and technology in which rock 'n roll infuses every line. As one reviewer said, "If Pete Townshend wrote a novel, it wouldn't be nearly this good"
Working on a small library of pop-song parodies of the current state of healthcare IT, including: "HIT Me Baby, HL7," "(Do) I Feel Lucky" (lamenting lack of QA for new clinical document types), "What A Girl Wants (Actionable Data)"
On Feb 26, 2014, in the city of Orlando, Florida, he sang the official ACMImimi song faster than anyone else that Ross Martin heard within that 10 minute span. Special commendation as the first individual to request admission as a Fellow of the College (September 3rd, 2010), though he did so through a post on his own blog and failed to fill out an official application form until December 9th, 2013. The College acknowledges this early demonstration of eminence and will accept this as evidence of his special contributions to the field should he ever apply to be named a Distinguished Fellow of ACMImimi (colloquially known as a Jolly Good Fellow of ACMImimi). Note that The College currently has no application process for Distinguished Fellows, but is considering developing such a program to differentiate the deeply eminent from the merely eminent in the art and science of Medical Informatimusicology. Conducted research with the able assistance of my colleagues at the "Dart Club" and at "The Dont Wannabees aka DWB" with the assistance of research labs the "Potomac Grill", "El Nopalito", Clydes-Chevy Chase, "Branded 72", "Outta the Way Cafe", "Dickies BBQ Germantown; "The Shanty" in Ellicott City; "Bennigins" in Clarksville and other comparable research facilities. 1993: Founding member of Emory University's male a capella ensemble "No Strings Attached". 1995: Percussionist, backup vocals for Scottish folk/jazz band "Java Jive" at the University of St. Andrews. 2002: Percussion and vocals for Pediatric Residency folk trio "Hand Foot & Mouth"
2003: Member of U. Penn "Ancient Voices"
2006: Member of the professional chamber choir "Voces Novae et Antiquae"
2011: Founding member of "Chestnut Street Singers"
Jussi Chydenius, "I am the great sun"
Ran a workshop at the GPET Convention in 2009 on the theme "Can Music be Used in Medical Education"
Founding member of The Arrhythmias, the house band of the University of Wisconsin School of Medicine and Public Health. First bioinformatimusicologist (self-proclaimed) as purveyor of Recombinant By Deloitte tools and services related to the secondary use of data, which will undoubtedly result in the creation of odes and jingles heralding their wares and successes. Uses Gimme My DaM Data video in her lectures on "Sharing Data with the Patient"
Inspires Fellows of The College to create music advocating for the sharing of patient medical information through his work on Chronology.MD - an iPad app that allows patients with Chron's Disease to self-track their health experience. Leads the Healthcare Leader #hcldr tweet chats, which recently held a series of chats on Music and Medicine. In-house Counsel on behalf of ACMImimi on all genderqueer-related matters and official speaker on "Genderqueer in the Healthcare System"
Suggested a new slogan for Fellows: "FACMImimi??? FAC-you-you-you, pal!" The "Song-a-Day" Guy - at least a few of those have had medical themes. Shred a lead line on her Backpacker guitar with Francis Collins, MD, PhD, FACMImimi for his son "Let's Knock Out Disease"
Presented to the Texas Dietetic Association Annual Meeting on Nutrition and HITECH: They loved the ending "Meaningful Yoose Rap" at the end! Actively promotes My other achievements are by promoting this fun site and concept, and assures others that she will not sing. Creator and Producer of "A Healthcare 2.0 Solution"
Performed The Rainbow Button Initiative with Regina Holliday and the entire crew at the "Secret Puppet Show" At Health 2.0 2011 in San Francisco as, not one, but two voices! Shook her head in shame at her own husband's rapping in "The Meaningful Yoose Rap"
Dissed his own father's rapping in "The Meaningful Yoose Rap"
Author, Producer and Performer of "HITECH: An Interoperetta in Three Acts"
Author, Producer and Performer of "The Meaningful Yoose Rap"
Author, Producer and Performer of "The Rainbow Button Initiative"
Author and Producer of "E-N-C-R-Y-P-T"
Author, Producer and Performer of "The HL7 Song (HL7 is the Way)"
Author, Producer and Performer of "The Legend of Bob the DERF"
Author and Performer of "If I Had an EHR"
Author and Performer of "The REC Theme Song"
Author, Producer and Performer of "The X12 Theme Song"
Author, Producer and Performer of "The MedBiq Song"
Author, Producer and Performer of "Ode to Blumenthal"
Author, Producer and Performer of "One Voice"